My favorite doctored up cake mix combined with my favorite from-scratch coconut buttercream. I love that this cake is both beautiful and simple. Originally posted in May 2014. 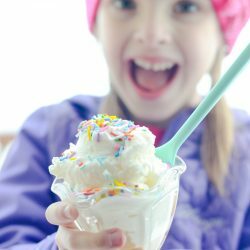 I thought it would be fun to celebrate this Mother’s day by spending this whole week posting the favorite dessert recipes of all of the mothers in my life! Starting with my Grandma. I’ve posted some of her recipes on here before. Check out this Red Velvet Cake and these Monster Cookies. Those are hers and two of my very favorite recipes. My Grandma is one of my heroes– both in the kitchen and out. She is genuine and kind and has always been such a great support to me. I am so thankful to have her in my life, and to really have her. She’s always taken a real interest in the things that are important to me and has been so encouraging of my pursuits. She has been such an important and permanent influence in my life…. as have her baked goods. So many of my memories of time with my Grandma revolve around holiday baking. I loved (and I still do) sitting at her counter, watching her work, and just talking. 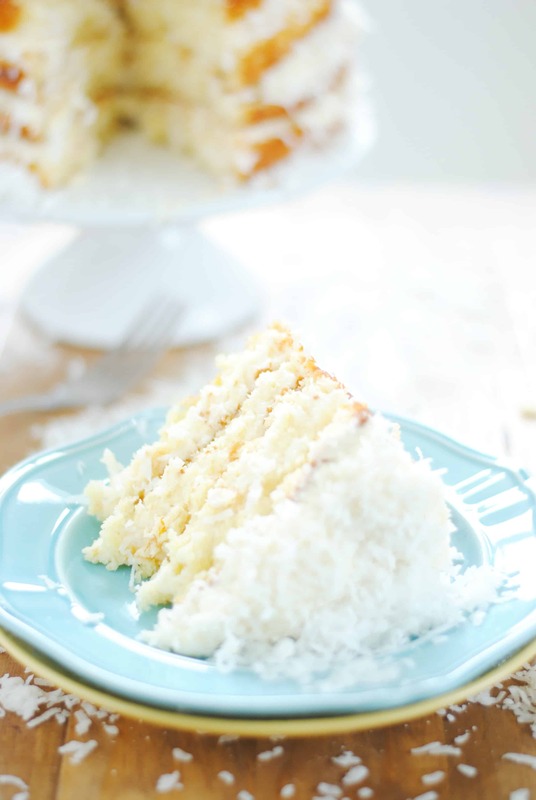 Grandma says she likes coconut cake best, so here we are today with a super easy and yummy coconut cake. Perfect for summer! 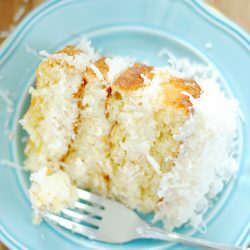 It’s simply my favorite doctored up cake mix (seriously, you can’t beat this recipe), and my favorite coconut buttercream. I love the layers on this cake too– just like the rest of it, they’re both beautiful and simple. Plus, my grandma is the queen of layered cakes. If she were making this, it would have at least 6 layers. Maybe I’ll get there one day, but for now I’m settling for a measly four layers ;). Beat together all of ingredients until smooth batter forms, reserving the coconut. Mix in the coconut with a rubber spatula. Pour batter into two 8-9" lined and greased round pans. Bake for 30-35 minutes until golden brown on top and toothpick inserted comes out clean. Let cool completely before cutting and frosting. In a stand mixer, beat the butter until it's smooth. Add the remaining ingredients by adding the powdered sugar (1 cup at a time) and the wet ingredients (first the vanilla, and then the milk 1 tablespoon at a time) alternately, mixing in between additions until smooth and desired consistency. Add the coconut, mix well. Add another tablespoon of milk if needed, and mix until smooth. Split each cake into two layers. 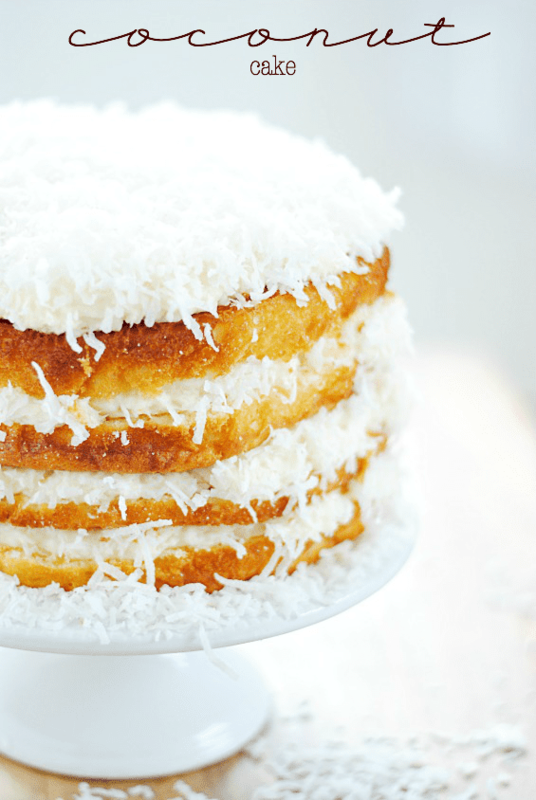 Spread a layer of frosting and a layer of coconut on each layer of cake, stacking the cake as you go. 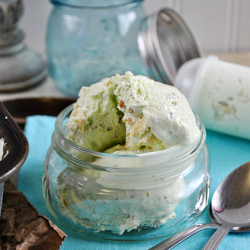 Easy Key Lime Pie Ice Cream & Push Pops + a Sweet Treats Duncan Hines giveaway! My mouth is watering! This cake is beautiful and looks absolutely delicious!!! My favorite cakes come from doctored mix! Nobody knows, and you can skip a lot of the drama with prep. It’s the best! 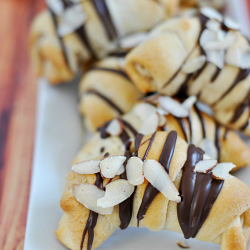 I love your idea to honor mothers through recipes this week. So nice! And this one’s a beauty. awww how sweet that this is in honor of your gma! 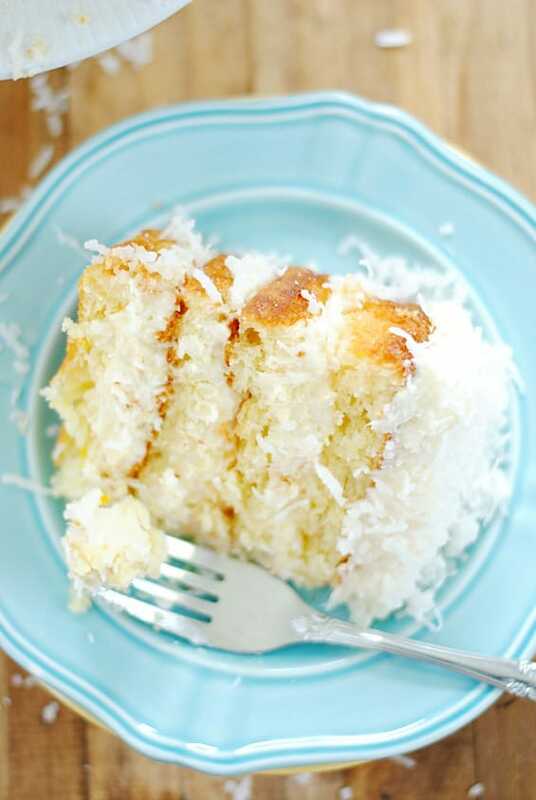 LOVE this coconutty cake-perfection! Wow does this cake looks amazing! I host Tasty Tuesdays and would love it if you linked up this recipe. I’m sure our party-goers would love it! Have a wonderful Wednesday Ashton! What a beautiful cake Ashton!